Last week, the Greater Memphis Chamber, Memphis Tourism and the University of Memphis invaded the state capital for our annual MEM2NASH legislative visit. 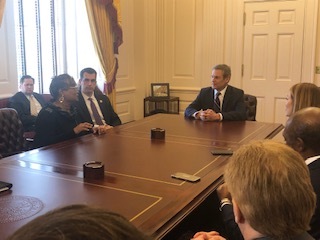 Members sat down with Governor Bill Lee to discuss priorities for the year and met with the Shelby County delegation. The visit is purposefully designed to showcase a strong Memphis presence from the hallways of the capital to the streets of Nashville. Members of the Memphis business community, tourism & hospitality industry and the educational institutions visited with state legislators on Memphis-related issues. The week began with Chamber Chairman, Richard W. Smith, President & CEO, FedEx Logistics, addressing members of the West Tennessee Caucus. Smith shared Memphis’ recent economic development successes with the group including the headquarters relocation announcements for Mimeo, IndigoAg,FedEx Logistics and JNJ Express. Smith also emphasized that Memphis was poised to be a disrupter when it comes to the emerging Ag Tech industry and outlined the Chamber’s new data-driven approach to attracting and growing targeted industries. A reception was also held for the entire Tennessee General Assembly at B.B. King’s Nashville. With live Memphis music playing in the background, Memphis business leaders interacted with leaders from both the House and Senate. Special thanks to our sponsors: Southwest Tennessee Community College, BNSF, Regional One and Methodist Le Bonheur Healthcare.